See Kelty (company) for the manufacturer. Kelty (Scottish Gaelic: Cailtidh) is located in Fife, Scotland. Kelty is a former coal mining village in the heart of the old mining heartlands of Fife. 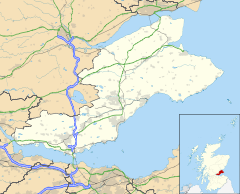 It is situated on the Fife/Kinross-shire boundary with a population of around 6,000 residents. This was nearer to 9,000 when the coal mining industry was still operational in late 1970s and early 1980s. Kelty is located next to the main Edinburgh to Perth road, the M90 motorway, and as a result of this has seen a large number of houses built primarily for commuters to Edinburgh over the past five years. Kelty has two primary schools, St. Joseph's and Kelty Primary. After primary school, the majority of pupils go on to Beath High School, a comprehensive school in Cowdenbeath, or the local Roman Catholic school, St Columba's High School in Dunfermline. Kelty also has a modern community centre, and a modern library. The local football team is Kelty Hearts who compete in the Lowland Football League, the fifth tier of the Scottish football league system. ^ "Kelty (Fife, Scotland, United Kingdom) - Population Statistics and Location in Maps and Charts". citypopulation.de. This Fife location article is a stub. You can help Wikipedia by expanding it.